When The Foundry announces the Nuke 9 beta testing for current subscribers (I’m currently on the graduate licence), I quickly jump on it knowing the perils of potential bug for my the side project I’m working on. The beta started early September 2014 and I’ve been using every beta version save for the last release before the full version launched two weeks ago. Also the beta include access to Nuke Studio (which is awesome but still have it’s own setback). This impression is not in depth and don’t cover an actual real world production scenario so take some of my words with a grain of salt for those who works at a big VFX house. For hobbyist? Well I can say it is pretty relevant. The native Flipbook is broken for me. I can’t get it to work so I use an external flipbook (JefeCheck). As much as I love the promise of a faster scanline renderer, it is miniscule improvement for me compared to Nuke 8. Maybe for really heavy scene, the performance is noticeable or either you need more cores to benefit from it. (I’m using Intel Core i7 4770K overclocked to 4.2GHz). The read node for MOV container is slightly faster than Nuke 8 (still noticeable although not a big boost in speed). I didn’t get to try the new OFlow speed but the algorithm is a bit better I think. The great part is the new control over the retiming compared to prior version. Finally a ‘look at’ pipe on camera, light, and axis nodes! Something that I miss a lot especially if you work with 3D authoring software like 3ds max, Maya, Modo etc. There is a new performance profiling timers that allow you to view which nodes is sucking up the performance juice on your system. Basically green nodes is fast while red nodes is slow. Again I rarely use it as I think it just add overhead to the overall rendering unless you are troubleshooting a rogue script. There is suppose to be a new mipmap filter in the scanline render but I can’t find it. Although it doesn’t matter to me again as I does most of my 3D render out of 3ds max and import in as EXR to my comp. PlanarTracker supposed to have a big upgrade but nothing that caught my eyes. Throughout the beta, the PlanarTracker node do suffer from this glitch where the roto shape is not in the Planar layer which annoys me badly. MotionBlur result is much much better than Nuke 8. I still think it is slower than Nuke 8 though but the result is really good so I guess it is worth the tradeoff. They change the Preferences window look which I think is minus for me. It is similar to Adobe look so those who prefer Adobe style preferences should be happy with the new look. I might miss out on a lot of other stuff but generally the above list is what impacted me the most for my workflow. Basically Nuke Studio is Nuke x Hiero with extra features. It is great in theory but a lot of the features are more suitable for higher end VFX house instead for hobbyist or indie VFX studio. Here is why I said it is more friendly for high-end VFX house: Nuke Studio really eat up more memories than Nuke. Even with me having 32GB of RAM, I find myself micromanaging the RAM usage as to avoid Nuke Studio from crashing (well it is a beta after all). So you can’t run Photoshop, 3ds Max, After Effects and even Firefox when you using Nuke Studio. Let’s say you limit the amount of RAM that Nuke Studio can use, you will suffer from long rendering time as you exhaust it from using more RAM when it needs to. Worst, Nuke Studio also stress out all the available threads on my Intel Core i7 4770K (which is a quad-core with hyper threading functionality which brings the total threads to 8). The way Nuke Studio works is that when you set a new comp in the timeline, you get to work with all the available Nuke X function and once you return back to the timeline editor (which borrows a lot from Hiero) it will start rendering in the background to update the preview file of said comp. Of course this means you are starving both available CPU threads and also RAM. So Nuke Studio is excellent in the sense that any supervisor can quickly jump into a comp script and make fine adjustment while it automatically update the timeline preview render. So no need to run both Hiero and Nuke as it is finally integrated under one roof. It makes for a great collaborative process with other artists if you have the workstation to handle it. Also I personally love Nuke Studio editorial functionally especially the soft effects which is a GPU accelerated effects that apply function like transform, mirror, crop, timewarp etc in real time. 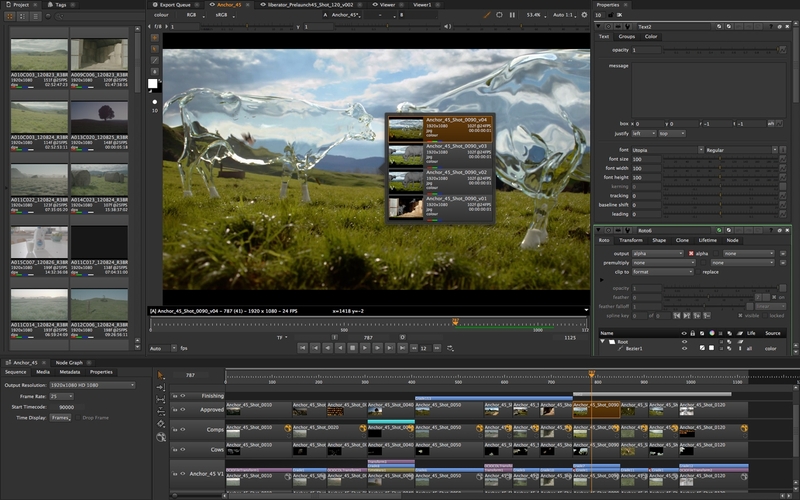 Knowing that Nuke Studio have Hiero function, it can also be used to do the final finishing and export if needed. If you on the fence on trying out Nuke, good news as The Foundry will announce soon a free version with most functionality intact early next year. For students, I highly recommend getting the student licence which is value for money as it comes with full access to Nuke, Hiero, Mari and Modo. I would like to express my gratitude to Dena Bakr at The Foundry for her active role in helping me out in acquiring the student licence as my ex-university still haven’t jump into the Nuke bandwagon back then (although my persuasion with the lecturers have finally paid off as they will be implementing Nuke lesson starting next year). 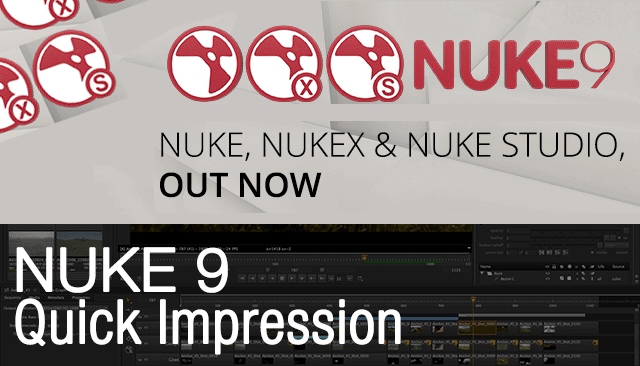 Sometimes seeing is believing but in this case, some of Nuke 9 promises do fall short for me during the beta testing. I still haven’t try out the current stable release (version 9.0v1) thoroughly yet. For now, I still say it is a major upgrade compared to Nuke 8 provided if you have the excess grunt power to use Nuke Studio. P/S: If you still solely using After Effects, do pickup Nuke skills! You will never regret it and it is an excellent compositing software out there in the market.